Change the cast; pick different songs; build a different set, but intrinsically, this is a reproduction. Four talented ladies at a Doe party talk about their social & sexual relationships in both song & dance to that era’s hits. One’s dating a ‘rebel’; one hankers after a ‘Lollipop’; another finds that linking with her male counterpart ‘hurts’. The last of the quartet emulates “Sister Act’s’ quasi-religious paean promising to ‘follow him’. Get the picture? Post-interval; another “Marvelous Wonder’ shtick and we’re six months later, different day; same s*#t! Obviously a little dramaturgical tweaking and the last songs are changed from the programme listing… “I do; I do” replaces a non-memorable Elvis Costello bit. Personally I’m convinced Brian Wilson’s “God only knows” should have been included! Now, all the positives. The talents exhibited by Stephanie Lawlor; Laura Mae Nason; Stephanie Pitsiladis & Kate Etienne are undeniable. They are triple threats: – dancers; faultless singers and convincing thespians. The latter’s oversexed Sally gets screwed socially as well as figuratively and yet is the most sympathetic of the group. Anyone who has ever suffered a liaisonal setback will identify with her. Pitsiladis’ Dee Dee at one point holds a high C so long that the audience applauds before her finale. Bean fails to give much depth to Nason’s bride-character but she does deliver as much of herself as the role permits. Lawlor: – just those very taut stretch –tights are almost enough to keep one’s eyes glued. Her singing & dancing are pure bonus. Kimberly Brown’s costumes, especially Etienne’s Mondrian mini-skirt & the wedding outfits are outstanding, colorful and a major contribution to the production .The set, by Samantha Burson is a little too busy but is effective as a vehicle for the meticulously choreographed song productions. As always; Anthony Bastianon and his orchestra are faultless, never overpowering and certainly a highlight of every STAGE WEST presentation. Finally- Chef Robert’s buffet. The lamb & especially his mint sauce is a treat; the new wontons & sweet ravioli, a must-eat. The desserts continue to be a calorie-conscious nemesis. The cheesecake & peach pie were both too appetizing-looking not to take back to the table. Once tasted, both were devoured. STAGE WEST is an experience. The hospitality is non-pareil; the food is scrumptious; the décor is warm & home-like; the shows – always entertaining. The cost – more than fair & certainly affordable. There is no occasion that could not be well-celebrated with an evening here Add a sleep-over to make it perfect! 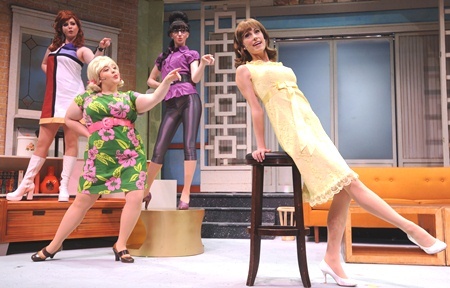 “WHY DO FOOLS FALL etc.” stays until September 5th.